Kinsey Millhone, P.I. is a 32-year-old, twice-divorced ex-cop with an irreverent, wise-cracking style reminiscent of Philip Marlowe - and a great pair of legs - who piles her trade in the small Southern Californian town of Santa Theresa. Make no mistake about it, Kinsey Millhone is one tough cookie. When a routine insurance claim she's investigating turns into non-routine trouble - someone has put $5,000 in her usually not-too-flush checking account and made it look like she's on the take - Kinsey sets out to discover who has set her up and why. The trail of evidence leads to the wealthy Wood family, which includes the three quirky sisters Olive, Ash, and Ebony. But she's not counting on the involvement of her long-departed ex-husband #2, who's gorgeous, seductive and also a junkie. And she's certainly not counting on murder . . . This installment of the Kinsey Millhone series was basically a story about a severely messed up, wealthy family. Full of emotional damage and backstabbing, it was a ride from start to finish. There was plenty of mystery to go along with the fast-paced story line. I also liked that we got a little more of a look into Kinsey’s past by meeting on of her ex husbands. She talks about them sometimes, but actually getting to meet one of them just added to the story. 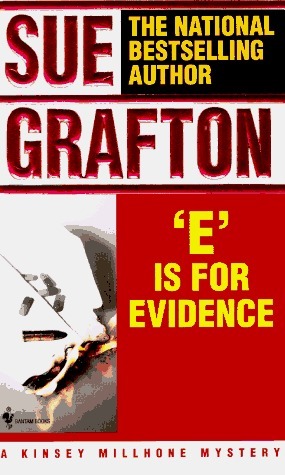 ‘E’ is for Evidence was full of mystery and action. I didn’t guess the twist until the actual reveal. I LOVE when that happens. Figuring our the main plot twist early in the book makes for a boring reading experience. ‘E’ was a very solid installment in this series.